Present: Chair-Supervisor Scott Mead, Supervisor Don Swanstrom, Supervisor Charles Kuettel, Treasurer Ray Barnes and Clerk Lita Wallace. Others in attendance: two residents and one non-resident. Oath of Office for newly elected supervisor: Kuettel was sworn-in. Clerk’s Report: Minutes of March meeting was presented and reviewed. Motioned by Mead to approve minutes, seconded by Swanstrom. motion carried. Mead motioned to approve March Treasurer’s Report, seconded by Swanstrom, motion carried. Update on a 2-day seminar attended by Mead on February 29 to March 1 – In January, approved reimbursement was for $300.00 but actual expenses for hotel and registration fee was $473.00. Swanstrom motioned to approve reimbursement of $473.00, seconded by Kuettel, motion carried. Notary stamp purchase for clerk to serve as Ex-Officio Notary for town business as required by Stat. § 358.15 – Wallace explained that town clerks simply by virtue of holding the office can notarize town documents and administer oaths of office. Cost will be approximately $30.00. Mead motioned to approve, seconded by Kuettel, motion carried. A representative from KTM Paving presented their proposal for repair of West Branch Road and a contract for signature. There are six sections for the project. Mead motioned to accept the contract in the amount of $98,700.00, seconded by Swanstrom, motion carried. Start date is weather oriented but confirmed that it will be completed before August 2018. Refer to the contract for information on the project. Approval of April 2018 Claims – Swanstrom motioned to approve April claims in the amount of $2,698.10 which includes a bill from St. Louis County for snowplowing, seconded by Kuettel, motion carried. Correction of clerk salary while performing election judge duties – Wallace explained that during the Spring Short Course attended, the trainer mentioned that since election is part of the clerk’s duties, clerks should receive a clerk wage during elections and not election judge pay. This is specified in Chapter 4 of the Township Manual. Mead motioned to approve correction of clerk salary while performing duties as election judge, seconded by Kuettel, motion carried. 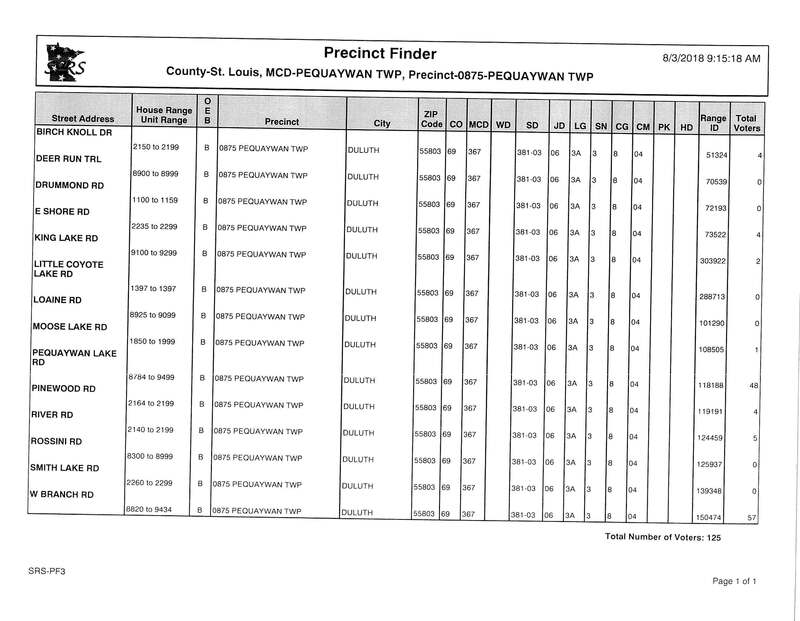 Emails from St. Louis Co. Election Department re-requirements for designation or change of polling locations; dates of election training for Election Clerk and Election Judge; and Order of Succession in emergency elections plan form to be completed and returned to the Election Department – Wallace will attend the Election Clerk Training (June 15) and Election Judge Training (July 20) at St Louis County in Duluth. The Election Judge Training’s purpose is to train the trainer, meaning, the clerk will in turn train the election judges. Public Comment: KTM will provide free estimate for private driveway work. Contact info: 218-729-1446.